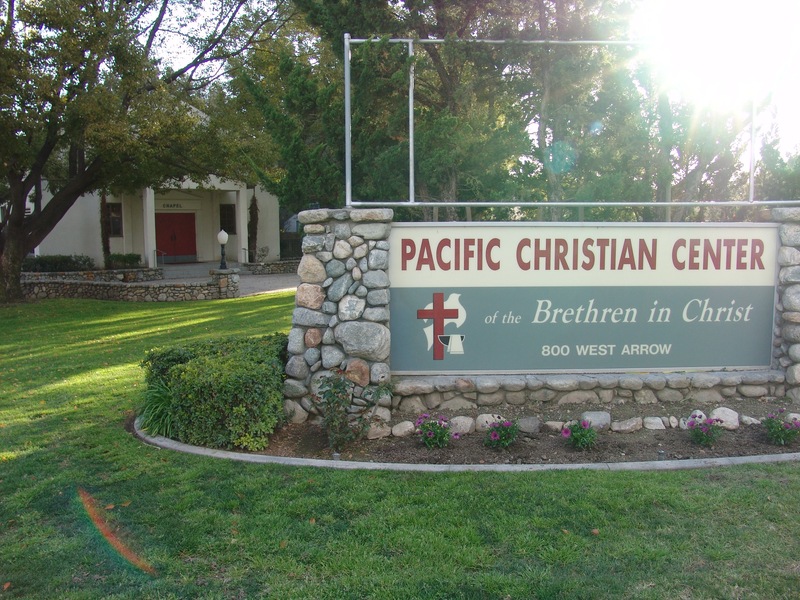 Last Thursday, I flew into southern California to attend the Pacific Regional Conference’s annual meeting, as part of my work for the Brethren in Christ Church. Finding myself with some down time one afternoon, I wandered around the West Arrow Highway/San Antonio Avenue area of town, stopped in for a tour of the Upland Brethren in Christ Church, and took in the sights. Along the way, I noticed some familiar buildings: they have different names now, and different purposes, but were recognizable nonetheless. 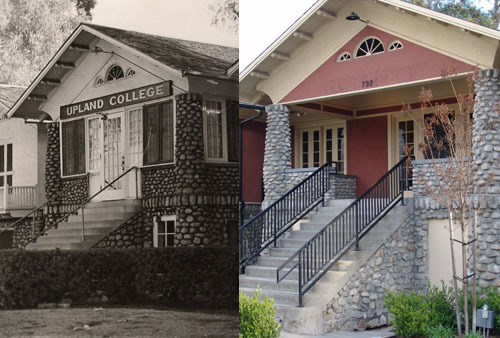 Upland College was started by the Brethren in Christ Church as Beulah College in the 1920s, just a few decades after they launched Messiah Bible School and Missionary Training Home in the east. After churning out some of the century’s leading Brethren in Christ churchmen and -women, the college officially closed its doors in 1964 when it was absorbed by Messiah College. Seeing double? This building once housed Upland College's administrative offices (left); today, it serves as office space for a number of organizations and businesses. 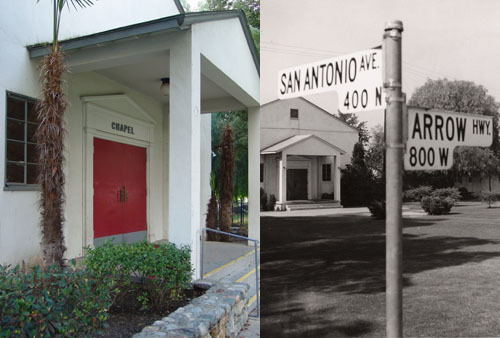 Situated at the corner of San Antonio Avenue and Arrow Highway, Upland College's chapel served as a place of spiritual development for students (right); today, the chapel is part of Pacific Christian Center's multifaceted campus (left). More photos from Upland College, past and present, after the jump. 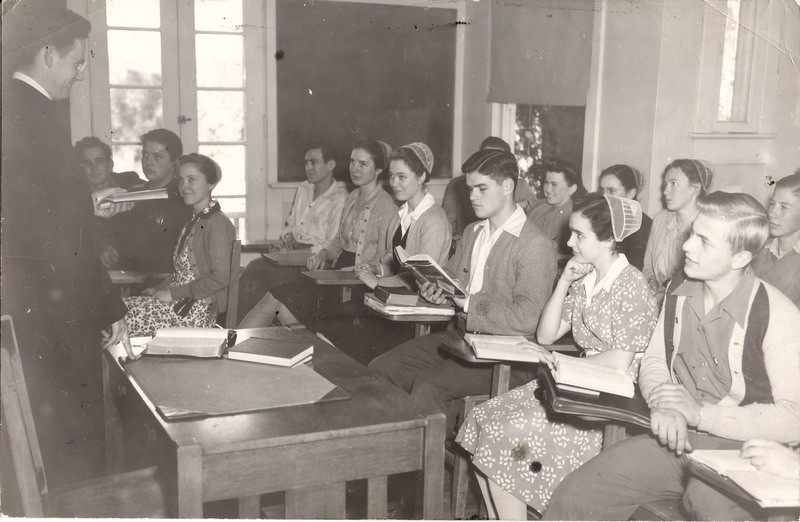 Bill Hoke (left) teaches a class on Bible doctrine at Upland College in 1944. 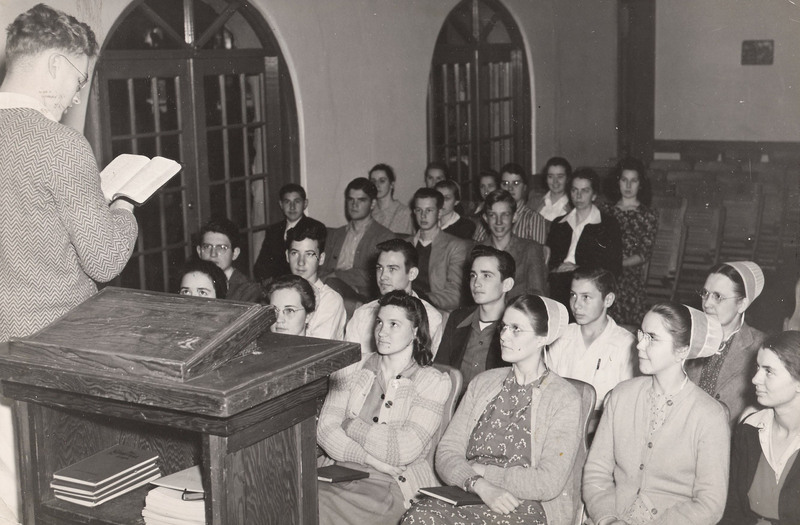 Owen Alderfer (left) reads to students during a chapel service at Upland (Beulah) College during the 1943-1944 school year. The original caption on the back of this photo read: "Tuesday and Friday noons students gather in chapel for a period of devotion." Thank-you for making “history come alive.” I’ve heard of Upland and wondered what had become of it’s property. My father was a registrar at Upland College, my husband is a graduate and also worked recruiting students in the 1960’s. I was supposed to graduate, but the college closed before I finished my degree. There does not seem to be a complete history of the college on the web. I know that there is a book detailing the history of the college. It may have been written by Morris Sider. Are you interested in working on such a project? My brother-in-law in Indiana is willing to help with such an endeavor. Your pictures bring back many memories. Judy: Thanks for your comment. I’m glad you appreciate the photographs of Upland College I’ve posted. 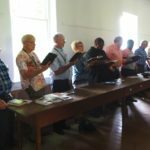 I was in Upland earlier this year, and it was great to learn a bit about the history of the school, the town, and the many Brethren in Christ connections to be made. 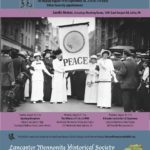 On the topic of an online history: unfortunately, that’s not the kind of project I can take on right now, but if your brother-in-law is looking for assistance, I’m happy to provide it as I can. 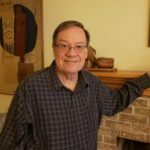 Morris Sider does indeed have a history of the college (written in the late 1960s or early 1970s) that would certainly be of assistance in such an endeavor. You or he could probably secure a copy by contacting Morris Sider directly; I have his contact info if you are interested. 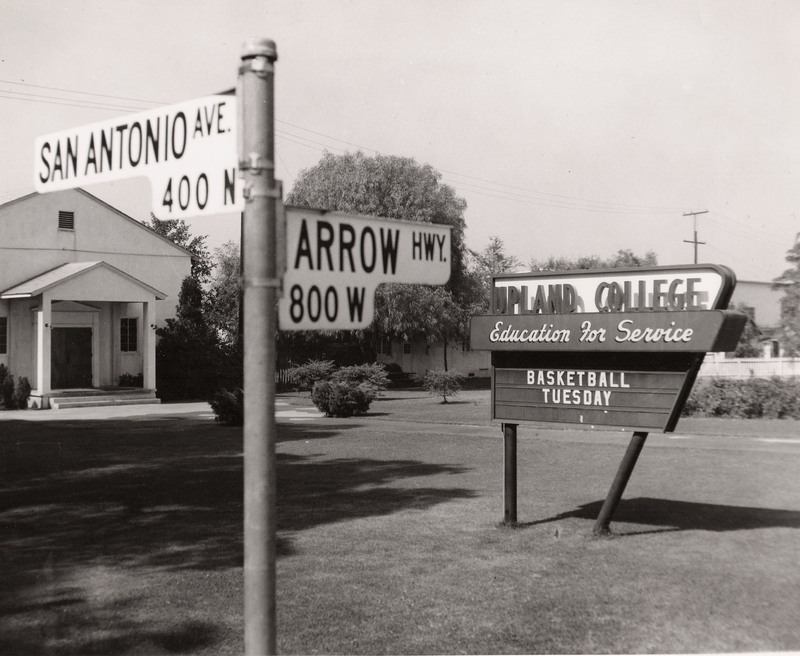 Pingback: The (Very) End of Upland College | the search for piety and obedience. I think the Astara group had this College Campus as their location for a period sometime after 1975. Absolutely incredible to find this page! Just this morning, I’ve been looking at my grandmother’s photographs of her days at Upland Bible College. Though most of the pictures were glued to the album, I was able to scan several photos of my grandmother and her friends, so I might upload them to my Ancestry.com tree. Her name is Marjorie Boyer Rohrer. She attended at Upland in the mid-1930’s. After attending school, she returned to her home in Ashland County, Ohio, where she married, Paul Rohrer. They were lifelong members at Chestnut Grove Brethren in Christ Church, now Ashland Brethren In Church. I love the picture of Owen Alderfer leading the chapel service. He and his wife were influential in my early years of my Christian faith. When my grandparents visited California over the years, they would always make arrangements to visit with my grandmothers friends. Thanks for educating me on this wonderful school!